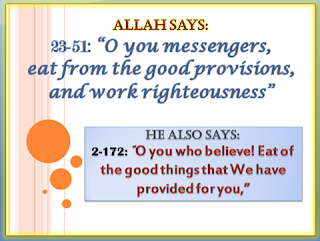 A believer who follows the creed of Allah in this life wants to nourish his body legally. When he nourishes his body legally, he has no desire for sins even if they are close and easy to him because Allah makes a barrier in his heart between him and sins. 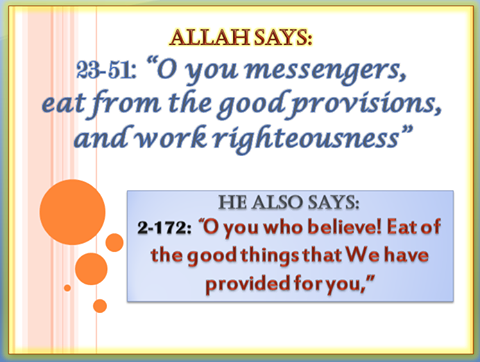 If the body is nourished by illegal food, he will go to sins. It was narrated that Haroon Ar'rasheed (the caliph) appointed his brother Bahlool (he was a virtuous man) to observe markets, it is like the ministry of rations now, to observe measures, scales and prices in markets. Bahlool worked for a year, he didn't make any cases for anyone. Haroon called him and said to him: "I see you didn't make any cases through a whole year, do all people behave according to Sharia'a?" He said: "O Ameer Al-Mo'meneen (prince of believers) I saw that Allah revenges from unfair people automatically." He asked: "How?" He said: "They spend the illegal money they get in sins and faults."